Mike Cappelletti breaks new ground by thoroughly analyzing Omaha and Omaha high-low poker. His penetrating instruction provides guidance for profitable decisions at every stage of the action. In-depth, winning hold ’em tactics are presented by exclusive agreement with Mike Caro, using words and wisdom directly from Caro himself. 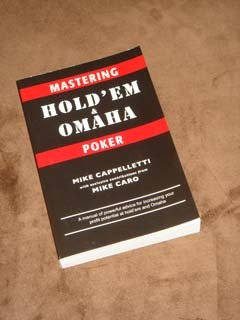 Finally, here’s a remarkable book combining advanced Omaha training with powerful, right-on-the-money hold ’em advice! Aimed at the new millennium and beyond, these hot pages sizzle with serious solutions for Omaha and hold ’em. How to get opponents who are targeting only half the Omaha high-low pot to commit their chips at poor odds. Page 167. From the basics to the most advanced, it’s a complete game plan for dominating your next Omaha and hold ’em games! hold ’em hands. Page 60. Additional notes from Mike Caro throughout the Omaha sections. Complete starting-hand guidelines for hold ’em by position. Hundreds of carefully chosen tips and techniques for serious poker students — all in one place! Let Mike Cappelletti and Mike Caro team up to give you the Omaha and hold ’em ammunition you need. This solid advice is expertly presented to be easy to follow and remember.